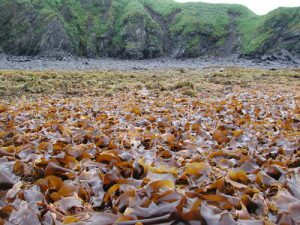 Coastal seaweeds are fundamental components of traditional diet and medicine for indigenous cultures worldwide, especially among Native American and Alaska Native (NA/AN) tribes and First Nations along the Eastern Pacific rim. Indigenous communities have harvested and consumed red, brown, and green seaweeds for generations, and these marine resources form an important part of the communities’ traditional ecological knowledge, providing important macro- and micro-nutrients, as well as a source of novel bioactive phytochemicals to protect human health. However, as NA/AN communities have shifted away from traditional sources of nutrition, the absence of these phytochemicals is believed to play a role in the exponential rise in diabetes, obesity, and other metabolic conditions in communities over the recent past few decades. For this project, six species of coastal Alaskan seaweed (Alaria marginata, Fucus distichus, Pyropia fallax, Saccharina groenlandica, Saccharina latissima, and Ulva lactuca) were evaluated in multiple in vitro assay systems for their potential to attenuate underlying causes of diabetes and obesity, and the underlying phytochemistry that might play a role in the observed bioactivity was investigated. The first study examined the chemical antioxidant capacity of these macroalgae samples. The highest DDPH scavenging activity was exhibited by F. distichus and Saccharina groenlandica fractions (IC50 4.29 – 5.12 μg/mL). Nitric oxide (NO) inhibition and radical oxygen species (ROS) generation inhibition assays were carried out using an in vitro RAW 264.7 macrophage culture, and F. distichus and Alaria marginata demonstrated the greatest inhibitory potential. A positive correlation between bioactivity and the seaweed’s total phenolic content was recorded. In congruence with the biological assays, the greatest TPC (557.2 μg phloroglucinol equivalents (PGE)/mg extract) was discovered in Fucus distichus’ ethyl acetate fraction (FD-E). These results suggest that Alaskan seaweed extracts contain powerful antioxidant phytochemicals that could offset oxidative stress-related chronic health conditions. A second study explored the inhibition of the carbohydrate-hydrolyzing enzymes, α-glucosidase and α-amylase. F. distichus and A. marginata contained fractions which significantly reduced enzyme activity, even more potent than the known pharmaceutical acarbose. F. distichus subfractions were potent mixed-mode inhibitors of α-glucosidase and α-amylase, with IC50 values of 0.89 and 13.9 μg/mL, respectively. Due to the activity of the F. distichus fractions, it was selected for further fractionation and subsequent identification of bioactive compounds. The observed bioactivity was associated with the presence of phlorotannin oligomers. Normal-phase liquid chromatography-mass spectrometry was employed to characterize individual oligomers, and accurate masses and fragmentation patterns confirmed the presence of fucophloroethol structures with degrees of polymerization from 3 to 18 monomer units. These findings suggest that coastal Alaskan seaweeds are sources of α-glucosidase and α- amylase inhibitory phlorotannins, and thus have potential to limit the degradation of carbohydrates and alleviate postprandial hyperglycemic spikes. Finally, investigations into the anti-inflammatory potential of Alaskan seaweed were carried out using multiple in vitro cell models. Extracts from the brown seaweeds (F. distichus, A. marginata, S. groenlandica, and S. latissima) were most effective at reducing gene expression of the inflammatory markers tumor necrosis factor-alpha (TNFα), interleukin-10 (IL-10), monocyte chemoattractant protein-1 (MCP-1), and the inducible forms of nitric oxide synthase (iNOS) and cyclooxygenase (COX2). F. distichus was selected for further study, and subfractions FD-18 and FD-24 significantly inhibited an array of 12 inflammatory markers in LPS-induced RAW 264.7 macrophage cells, reducing expression levels to basal levels. This phenomenon appeared to proceed via reduction in expression of toll-like receptor 4 (TLR4). In murine 3T3-L1 adipocytes, the brown seaweed reduced lipid accumulation in mature cells, and the active subfractions FD-18 and FD-24 lowered lipid levels to 48.5% and 45.9 % of the untreated control, respectively. The two subfractions also reduced inflammatory gene markers in a dose-dependent manner, while increasing adipogenic genes uncoupling protein 1 (UCP-1) and adiponectin. The fraction FD-24 was found to contain higher molecular weight phlorotannin oligomers ( >10 DP), while FD-18 contained a monoglycosyldiacylglycerol (MGDG) structure containing two eicosatetraenoic acid (C20:4 ω-3) fatty acid residues. These results suggest that brown Alaskan seaweeds, especially F. distichus, contain multiple phytochemicals capable of ameliorating inflammation in both macrophage and adipocyte cells, and are able to reduce the potential lipid accumulation in mature adipocyte cell systems. Collectively, these findings suggest that Alaskan seaweeds contain different classes of phytochemicals that modulate multiple pathways associated with the development of metabolic syndrome. The bioactive phytochemicals were capable of combatting oxidative damage, reducing metabolic overload through lower digestive enzyme activity, and lowering the expression of chronic inflammation makers and inhibiting lipid accumulation in mature adipocytes. Thus, this study highlights the potential of Alaskan seaweed as a dietary agent to support human health and protect against insulin resistance and obesity.